Custom project roles can be created to apply a set of restrictions to the users. In Kanboard, each user can be a member of one or many groups. A group is like a team or an organization. Only administrators can create new groups and assign users. Groups can be managed from User management > View All Groups. From there, you can create groups and assign users. Each project manager can authorize the access to a set of groups from the project permissions page. The external id is mainly used for external group providers. Kanboard provides a LDAP group provider to sync automatically groups from LDAP servers. To add a new user, you must be an administrator. For remote users, only the username is mandatory. When you go to the users menu, you have the list of users, to modify a user click on the edit link. From the users menu, click on the link remove. This link is visible only if you are administrators. If you remove a specific user, tasks assigned to this person will be unassigned after the operation. Each user can enable the two-factor authentication. After a successful login, a one-time code (6 characters) is asked to the user to allow access to Kanboard. This code has to be provided by a compatible software usually installed on your smartphone or a different device. Kanboard use the Time-based One-time Password Algorithm defined in the RFC 6238. This system can work offline and you don’t necessarily need to have a mobile phone. You have to save the secret key in your TOTP software. If you use a smartphone, the easiest solution is to scan the QR code with FreeOTP or Google Authenticator. A new secret key is generated each time you enable/disable this feature. 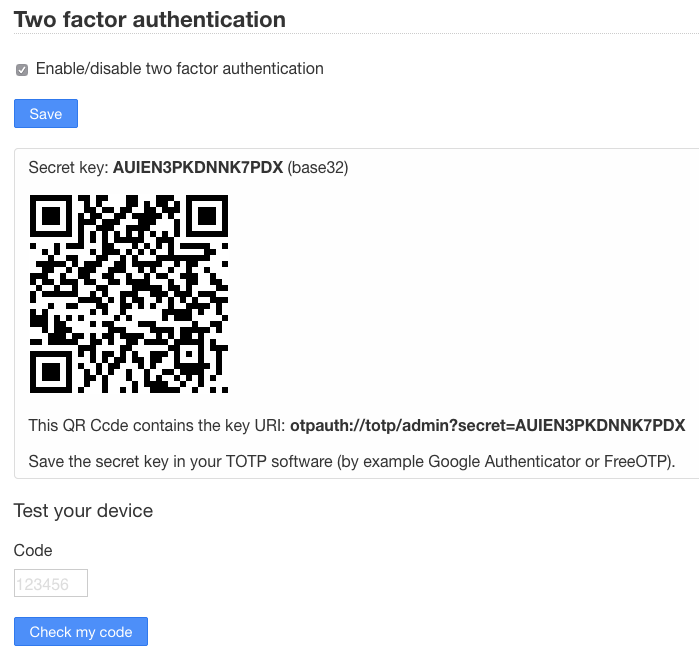 Since Kanboard v1.2.8, people with two-factor authentication enabled must use API keys.